Columbus is buzzing with hockey this weekend. Not only is the city playing host to one of the most heated rivals in the NHL, Columbus Blue Jackets vs Pittsburgh Penguins, they are also holding two tournaments for youth hockey this weekend. If you live near Columbus, be sure to take a few hours out of your weekend to soak in some good old fashioned hockey. Semifinals were held yesterday at Nationwide Arena for the OHSAA Ice Hockey Tournament. The first game, between Hunting Valley University School and Dublin Coffman, went into overtime. Hunting Valley University School would go on to win in overtime. Cleveland St. Ignatius dominated their opponent, Toledo St. Francis, 5-1 to secure them a spot in the Championship. The Championship game will take place at Nationwide Arena on Saturday at noon. Bob McElligott and Jody Shelley will be calling the game. Be sure to get there early as the Senior All-Star Game will take place at 10 am. Update: St. Ignatius beat Hunting Valley University School,4-3,to become State Champs for the second time in 3 years. The Ohio AAA Blue Jackets of Tier 1 Elite are hosting Mid-American Districts for 18u,16u, and 14u boys as well as 19u girls. Districts for Tier 2 14u, 16u,and 19u girls are being held through out Columbus as well. If you have been waiting to see Dancing Kevin dance this season you will have a chance to see him at Friday’s 6pm game at the Ice Haus. The 14u Ohio AAA Blue Jackets will be taking on their rival the Pittsburgh Pens Elite at that time. When the two teams played last they had to call the game early because of a few broken bones and fights. It will be a real barn burner. The 18u and 16u boys games are always a joy to watch. You get to see many future NHL draft picks in the making at districts. If you can only attend one game this weekend, I would hands down pick an 18u Cleveland Barons game. They will be laying their heart and soul out on the ice this weekend to earn that coveted spot to Nationals. In their eyes winning Nationals will be the best way to honor their coach, Tim Alexander, who died this past January. The sheer talent within each player on the AAA Jackets 18u and 16u teams this season are worth your time to watch them play this weekend. If you have an aspiring goalie in your life be sure to bring them to one of the 18u AAA Jackets game this weekend. They have a stellar goalie by the name of Eric Dop. He has skill, passion, and knows how to protect himself while in the net. Girls hockey has exploded over the past few years in Columbus and the surrounding area. This weekend is a chance to showcase their talents to the masses. I suggest taking in a couple of girls games as well. Below is the schedule of all games this weekend. All games will be held at Chiller North with the exception of the 6pm Esmark Stars vs Junior Jacks game. This will be held at the Easton Chiller. 14U AAA Blue Jackets go over plays before a game. The winner is determined by the most points at the end of the weekend. The Pittsburgh Pens Elite became the 14U Mid-Am District winner. The team with the most points at the end of the weekend wins districts. 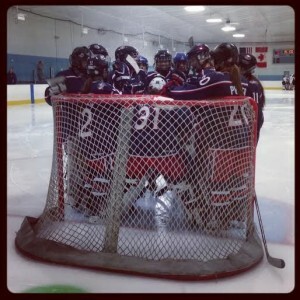 Ohio AAA Blue Jackets Girls gather round the net for a pregame meeting. All games will be held at the Dublin Chiller. The Steel City Selects were the T2 U14 Girls Mid-Am Districts champions. Most points at the end of the weekend wins the tournament. All games take place at the Dublin Chiller. The Steel City Selects took home the T2 16U Girls Mid-Am Districts championship. The Steel City Selects went on to win the T2 19U Girls Mid-Am Districts Championship.